“THE PEOPLE COULD FLY,” the title story in Virginia Hamilton’s prize-winning American Black folktale collection, is a fantasy tale of the slaves who possessed the ancient magic words that enabled them to literally fly away to freedom. And it is a moving tale of those who did not have the opportunity to “fly” away, who remained slaves with only their imaginations to set them free as they told and retold this tale. Leo and Diane Dillon have created powerful new illustrations in full color for every page of this picture book presentation of Virginia Hamilton’s most beloved tale. The author’s original historical note as well as her previously unpublished notes are included. Virginia Hamilton, the first Black to win a Newbery Medal and the first children’s book author to be awarded a MacArthur Genius Grant, won the Coretta Scott King Award for The People Could Fly: American Black Folktales. She died in 2002 at the age of 66. 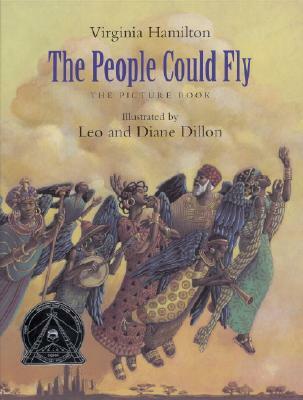 Leo and Diane Dillon, recepients of two Caldecott Medals, have illustrated five books by Virginia Hamilton, including the original black-and-white illustrations in The People Could Fly collection, Many Thousand Gone, and Her Stories. Leo and Diane Dillon live in Brooklyn, NY.